The Bermuda International Film Festival screened The Attack last night, a gripping drama about a Palestinian doctor working in Israel. Dr. Amin Jaafari (Ali Suliman) is an Arab working in a Jewish world, he’s a prominent and successful surgeon, has a beautiful wife, and friends. But when a suicide bomb claims the lives of 17 people, including 11 children, Amin’s life begins to fall apart as he learns he’s neither accepted in Tel Aviv nor the Arabic community in Nablus when evidence points to his wife, Siham (Reymond Amsalem) as the bomber. As he begins to deal with his grief and anger he begins to reexamine his relationship with his wife, his friends and his job as he begins to investigate the attack on his own. 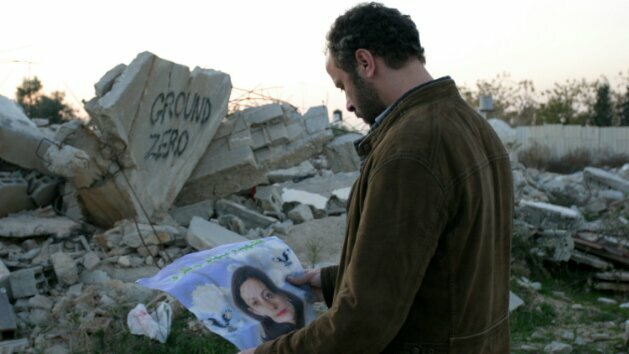 Suliman is dead-on as a man coming to grips with loss and betrayal, he recalls his wife lovingly but when other truths begin to emerge that love changes, is tainted, and he can’t reconcile the woman he loved with the image of her as a terrorist in Tel Aviv, or an icon in Nablus. Beautifully photographed it captures and holds the attention. Jaafari is considered guilty by association, even considered a full-on suspect who helped convinced his wife to set the bomb off (women suicide bombers tend to garner more media attention). His life is literally left in shambles, he’s grilled in prison bu the incredibly intimidating Captain Moshe (Uri Gavriel), his house defaced, his family is keeping secrets from him. It’s a unique look at a man with his foot in both worlds, at a point where he seems to be accepted by neither, trying to understand the actions of someone he spent the last 15 years with, someone he shared everything with. Working from the novel by Yasminda Khadra, Doueiri helped adapt it to the big screen, and as drama it works completely, there were moments I thought they were going to rev the cylinders and kick into thriller territory, but it didn’t happen, instead deciding to remain an engaging character film. I think for an American remake there would be more of a thriller aspect to it, but this way totally works, especially the recollections of his wife, their relationship, the very poetic imagery used to portray their romance. Slowly though, as he begins to suspect his wife’s actions, his memories begin to change, as he begins to imagine the actions and secrets Siham was capable of. He not only has his physical life torn apart, but his emotional one is ripped asunder as he realizes nothing he believed or thought could be true after all. There are a number of heartbreaking moments in the film, Amin’s visit to the morgue, the letter, and watching a video his wife didn’t realize was being made. BIFF has shown some truly amazing films this week, and it’s been a true delight to see them, it’s a festival that seems to perfectly balance the narrative film with the documentary, and there tends to be something for everyone! There are two nights left, what are you going to see?